Investing in a new door for your garage is a sensible investment that should last for many years to come. A top-quality garage door can also add value to your home, improving the frontage of your property. When you first start browsing, it can seem a little daunting as there are so many different types to choose from. There are different styles of operation, design and finish, so it’s worth taking some time to explore the options to ensure you get the right garage door for your needs. Doors that come in a one-piece structure are the most popular option for many households. They are good value for money and are available in a choice of steel, natural wood or glass-reinforced polyester. 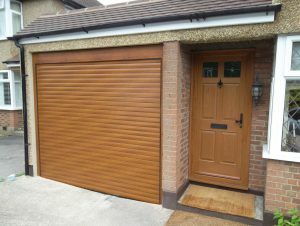 One of the most compact doors available is the roller shutter garage door. These open and close vertically without the need for an internal mechanism. These doors are perfect for those with 4x4s or people carriers who need to make use of as much space as possible. These doors are also highly versatile and can be installed in almost any position and in any size and shape of garage space. Sectional doors are popular for their practicality, stylish looks, safety and security. They are sectional in that you can open and close individual panels. You can also maximise space as the door opens vertically, with no need to allow for swing-out space. There is also no internal tracking mechanism required. Up and over are one of the most common garage door types found in the UK. They consist of one single panel and come in a massive range of colours, styles and materials. The disadvantage is that you need to leave space for the arc of opening and closing the door. However, they are an economical and durable choice. 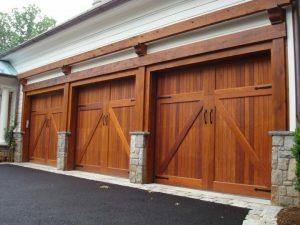 Side hinged doors are less common but great for solving many different issues where no other type of garage door can be installed. Easily maintained and simple to use, they come with minimal mechanical parts and are a great option for awkward spaces.